A mod for avoid "out of memory" error and related, in post-1.7.10 minecraft versions; Force the game to work like in the past ! In the past, minecraft 1.7.10 and inferior versions had a very good working on old computers. It is possible to put dozens and dozens of mods in these versions without receiving lag, for example, if you has a decent CPU. However, after 1.7.10 versions, play with mods is a torture. 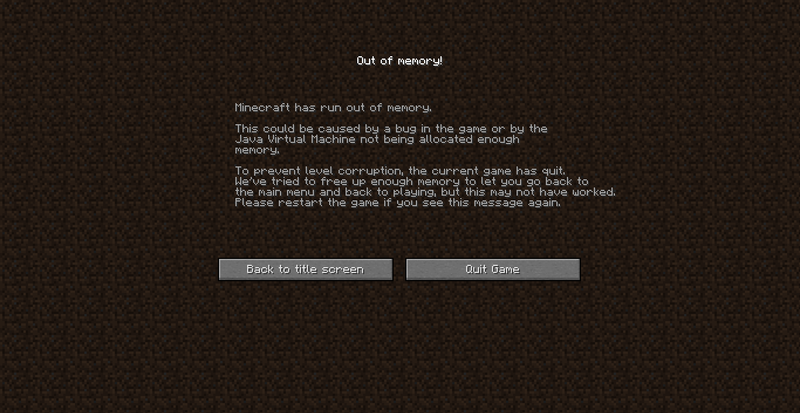 Put more than 10 big mods in minecraft 1.12.2, having windows 32 bits, and your game will crash with the annoying message "java has run out of memory". I request a mod that forces new versions of the game to work like in minecraft 1.7.10 and previous versions, then not needing OpenGL 3 for playing decently, nor causing lag due to graphic processing simulation (due to not be able to have OpenGL 3), nor crashing by become "out of memory" in java. I doubt anyone will ever make a mod like this, if it can even be done. 1.) Get a modern computer. Like seriously, $300 can get you a good enough computer to play Minecraft at 60-100 fps even with Forge and mods. 32-bit computers are almost unheard of now. If running out of memory is your problem, just allocate more memory into Minecraft through its launcher. 2.) Find (or request) a mod or mods that add all the new Minecraft features into 1.7.10. I know there used to be one out there, but I don't know how updated it is. It’s actually already part of the launcher. 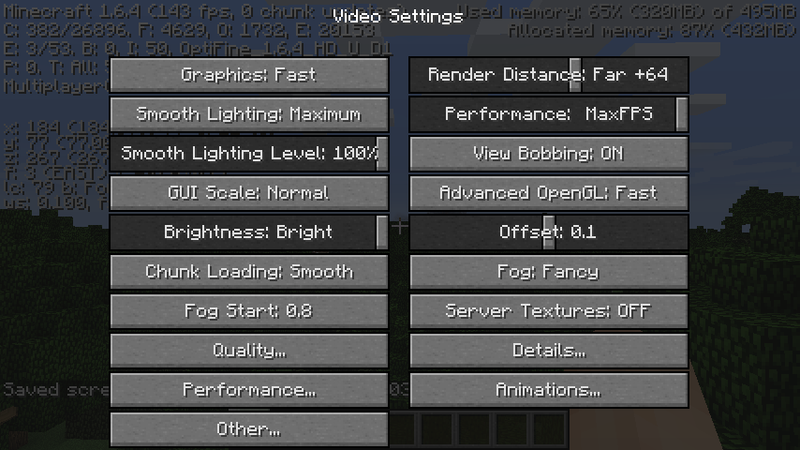 There are videos that explain it better, but as long as your computer has the hardware for it, you can set minecraft’s Allocated memory to whatever you want, all from the vanilla launcher. If your third party launcher bypasses the vanilla launcher, it may still have this ability as well. short version, it’s already vanilla. This will not help if you have a 32 bit OS, which can only use about 1 GB of RAM, which is the default allocation (which was recently increased to 2 GB for 64 bit systems), while I see people saying that modern modpacks need 4 GB+ just to start up - the is simply no way you'll ever be able to run them on a 32 bit OS. In fact, even vanilla has given me a "Minecraft has run out of memory" error screen when using Far render distance on 1.6.4, a much less demanding version than modern versions* (my older computer even had issues with 1.7+) - unless I reduce the amount of memory allocated - this may make no sense until you realize that a 32 bit program can only use 2 GB total and this includes memory outside of the JVM, including the JVM itself and OpenGL (higher render distance = more memory needed by OpenGL. This also seems to be related to the fact that my older computer only had 256 MB of dedicated VRAM and would run out, using system memory instead, as I have not seen this happen on my current computer, which is still 32 bit. Despite the system requirements calling for a minimum of 4 GB (this used to be the recommended until recently) I have not had any issues with this in itself, with 1+ GB free while playing). As far as making newer versions run like older versions, you are much better off using mods to add features from newer versions because you'd have to rewrite most of the game, and any Forge mod would not come even close to optimizing it fully and be much more difficult to implement, and probably be incompatible with any other mod anyway since mods were written to interact with the code as written for current versions; this is why Optifine often causes issues since it directly replaces various vanilla code. One such mod is Et Futurum, though it hasn't been updated recently and appears to be incomplete (they mention rabbit items but no rabbits, and ocean monuments without guardians; of course, many other mods add their own versions or equivalents of many newer vanilla mobs and other things). Mods themselves are also to blame; as mentioned before, Forge by itself adds a huge overhead, probably because it adds in hundreds or thousands of hooks so mods can interface with the vanilla code without modifying it (as one of the entire reasons for it is to allow multiple mods to work together, before then you could only do this if the mods did not modify the same classes, or sacrifice some functionality, as my own mod does with Optifine, or use patched classes that combine the changes with permission from the creators), and many mods aren't well optimized, if at all (even then, I can't even see how they would need so much memory even if they added thousands of new blocks and items; the memory usage that I see is mostly accounted for by the amount of memory loaded chunks take up. Even older versions are claimed to need a lot more memory than what I see; this Reddit post claims that 1.3 needs 500 MB just to start up, more for 1.5-1.6 but the mentioned changes in 1.5 are nonsensical since the game always used an atlas to store textures in memory, it just now loads them separately, and the size of the jar for 1.6.4 is actually considerably smaller than even 1.4.7).